Collinsworth, via Sunday Night Football. Cris Collinsworth's Pro Football Focus Weekly Report was one of three projects approved by the Kentucky Tourism Development Finance Authority for financial incentives from the state of Kentucky. 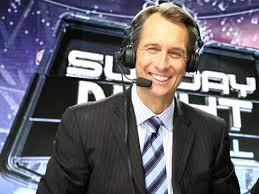 The televised sports program, owned by Collinsworth and filmed in Northern Kentucky, estimates that $1 to $2 million dollars will be spent in Kentucky on the program. Under the new film incentive law approved this year, approved film and television projects completed in Kentucky are eligible for up to a 30 percent tax rebate. Additional rebates are possible for using Kentucky labor and filming in certain counties. A feature film called “Permanent” by Permanent Pictures LLC that is expected to be filmed this year and spend about $800,000 in Kentucky. A feature film called “The Ultimate Legacy” by ReelWorks Studios LLC that will be filmed in Kentucky this year with a projected Kentucky budget of $1.25 million.